Leveraging the power of Apple's iOS and Bluetooth LE, Rock Hawk delivers data on rock timing and speed to improve your delivery and weight accuracy. Easy to set up and useable by a single person or your whole team, Rock Hawk will improve your consistency and optimize your practice time by providing immediate timing and speed feedback on an iPad or iPhone display. Designed for the novice and the professional, Rock Hawk can raise your game up to the next level. To use Rock Hawk, you place one or more timing beams on the curling sheet, connect them to the Rock Hawk app on your iPad, iPad mini, iPhone or iPod touch, and start timing. Each timing beam consists of two small boxes: a laser box and a sensor box. Timing occurs automatically when rocks pass through each timing beam. With a single beam placed anywhere on the sheet, measure the speed of the rock at that point. Place the beam just past the near hog line; the rock speed will correlate with your delivery weight. Consistent weights will show consistent rock speeds. Place a beam at each hog line to time hog to hog, or place two beams anywhere on the sheet and time that interval. Optionally measure the speed of the rock at the near hog. Hog to hog time is the standard by which to measure rock weight and ice condition. Place a third beam at the back or tee line to measure the split time in addition to the hog to hog time. Optionally measure the speed of the rock at the near hog. Correlate split time, speed of rock and hog to hog time to detect delivery inconsistencies. Timing beams communicate with the Rock Hawk app using the latest Bluetooth technology. Exceptional battery life means a single set of batteries can last an entire season (depending on usage). Exceptional range means your iOS device(s) can be positioned on the sheet or behind the glass. No wires means quick and easy set up. Connect Rock Hawk on multiple iOS devices (iPad, iPad mini, iPhone, iPod touch) to set up multiple displays. Use iPads for large on-sheet displays. Use iPhones or iPod touches as handheld displays - ideal for the skip or coach. Start with one beam to measure rock speed. Add a second beam to time hog to hog or any interval on the sheet. Add a third beam for hog to hog and split times. Use multiple systems on different sheets in the same rink. Zero interference! Expand as your budget permits. Rock Hawk saves timing data as rocks are timed. Import rock history into a spreadsheet or word processor for further analysis. Compare timing data from practice to practice, from rink to rink. Hone your skill and ingrain throwing consistency. Each timing beam consists of one laser box and one sensor box. Start with one timing beam to measure speed of the rock at any point. Expand to two or three beams as your budget allows. The Rock Hawk carrying cases makes it easy to take your timing beams with you to any club. 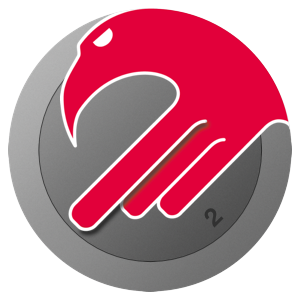 The Rock Hawk app works on any iPad (3rd generation or newer), iPad mini, iPhone (4s or newer) or iPod touch (5th generation). It is available on Apple's iTunes App Store. 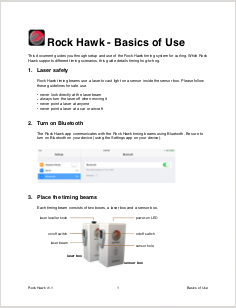 You can download Rock Hawk's Basics of Use user document here. Click image above, or right/control-click to save the PDF document on your computer. With Rock Hawk you get unparalleled ease of use, amazing battery life, and trackable results that you can review from practice to practice. A Rock Hawk timing system consists of one, two or three timing beams and the Rock Hawk app that runs on an iPad, iPhone or iPod touch (not included)1. A single timing beam, which includes a laser box and a sensor box, is priced at $349. 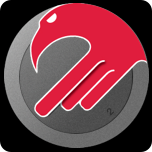 The Rock Hawk app is $24.99 and is available only on Apple's App Store. Based on the timing configurations you'd like to use, choose one, two or three timing beams and order them here2. Each timing beam comes with four AA batteries, two for the laser box and two for the sensor box. 1 Rock Hawk app requires iPhone 4s or newer, iPad 3rd generation or newer, iPad mini or iPod touch 5th generation. 1 Rock Hawk app requires iOS 8.x. 2 Rock Hawk will ship only to Canadian addresses. 3 All pricing in Canadian dollars. 3 Pricing subject to change without notice. We are working on an online order system. For now, to order Rock Hawk timing beams or carrying cases, please contact us by phone or email, or by filling out this form. To buy and download the Rock Hawk app, click or tap the link below to go to the iTunes App Store. While we cannot offer refunds for purchases of the Rock Hawk app, we offer a 30-day money back guarantee for Rock Hawk timing beams and carrying cases. How long does it take to set up Rock Hawk? Setup takes only a minute or two. For each timing beam, you place two boxes on the ice at the timing position (e.g. back line, tee line, hog line), turn them on and aim the laser at the sensor. You open the Rock Hawk app on your iPad, iPad mini, iPhone or iPod touch, connect to the timing beams and you’re ready to time rocks. How long do batteries typically last? Each box (laser and sensor) uses two AA batteries. Batteries last well over 100 hours of use. So in many cases, batteries will last an entire season. We tested with standard Duracell AA batteries. How does Rock Hawk measure the speed of a rock using only a single timing beam? Rock Hawk times how long a rock breaks a timing beam and uses that duration to calculate the rock speed. Are there any limitations to Rock Hawk’s method of measuring rock speed? Yes. It is necessary that the rock completely pass the beam before your broom or any other object. If your broom reaches the beam before the rock has completely passed the beam, we call that “broom interference” and the speed reported will not be accurate. Also, rock speed accuracy relies on a consistent rock diameter from rock to rock. If you are using old rocks with varying diameters, you will see slight inaccuracies in the reported rock speeds. Are there any other limitations to the Rock Hawk timing system? With risk of stating the obvious, it is necessary that the rock be the first object to break each timing beam. You need to be sure that your broom does not break the timing beam before the rock does. What happens if someone accidentally walks through and breaks a beam? It depends. When the timer is reset and ready to time, breaking the first beam will start timing. So if someone accidentally breaks the first beam, you’ll need to reset the timer before throwing a rock. Note, however, that only the “next” beam to be broken by the rock is considered to be “live”. For example, if you’re timing both split time and hog-to-hog time (which means you have three beams placed), and you are ready to time a rock, only the back or tee line beam is “live”. The near and far hog line beams can be broken without issue. Once you’ve delivered a rock past, say, the near hog line, only the beam at the far hog line is “live”. The back or tee line and near hog line beams can be broken without interfering with timing. How is the timer reset? There are several reset options. The most common option is to have Rock Hawk automatically reset a certain time after timing of a rock completes. If you are training by yourself, you might set an auto reset time of around 20 seconds. That gives you enough time to deliver a rock, watch it come to rest, then return to the hack for the next rock. If you and your team are training, you might set the auto reset time to five seconds so the next player can throw shortly after the previous player. You can also select options to reset by tapping the screen or by pressing the volume buttons (ideal for iPhone and iPod touch devices). Can sweepers sweep when timing rocks? Yes, as long as the rock breaks the beam first. When timing split time and hog-to-hog, it is recommended that sweepers wait between the back or tee line and near hog line and stay behind the rock. Once the rock crosses the hog line, sweepers can cross and begin sweeping. When the rock nears the far hog line, sweepers momentarily stop sweeping to allow the rock to cross the beam first to complete the timing. Sweepers can then resume sweeping the rock beyond that point. Any issues regarding placement of the timing beams on the ice? Each timing beam has a neoprene pad on the bottom that makes it easier to aim the laser at the sensor. If you store your beams in room temperature, you might notice slight melting of the ice as the bottom pads release stored heat. Does Rock Hawk work with Apple's 12.9 inch iPad Pro? Yes. Rock Hawk version 1.1 or newer takes full advantage of the larger screen on the 12.9 inch iPad Pro. If you would like to receive news about Rock Hawk, please enter your email.